Wade R. provided this image of the 1976 Pinto at Oswego running up the return road. I attended the North American Auto Show in Detroit in January. Ford had an ‘Performance’ area within their booth. There was a small area there talking about Drag Racing. The content below was part of that presentation. 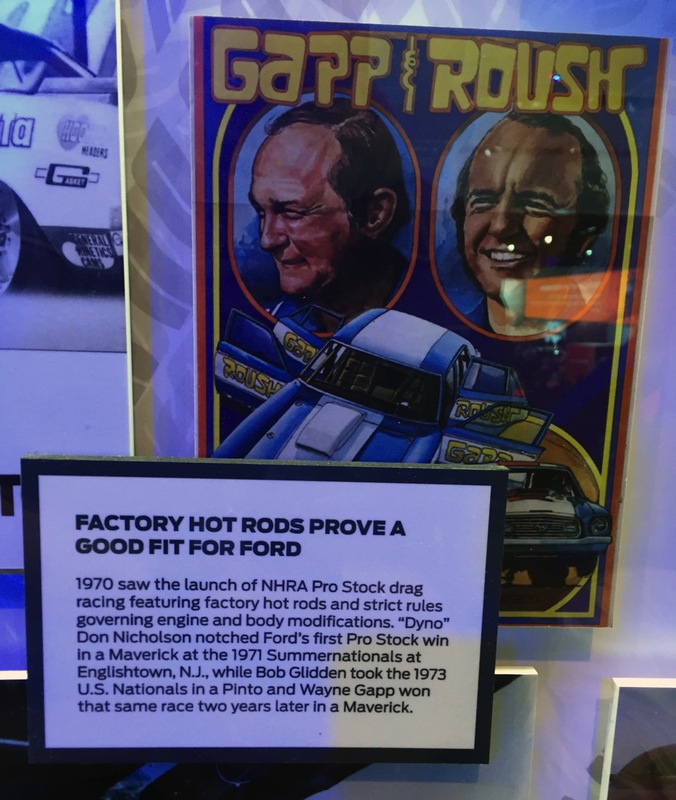 I have no idea why they don’t mention that Gapp & Roush won the 1973 NHRA Pro Stock World Championship. I swung out to the Suburban Collection to take a look at this car that the Roush folks have restored. 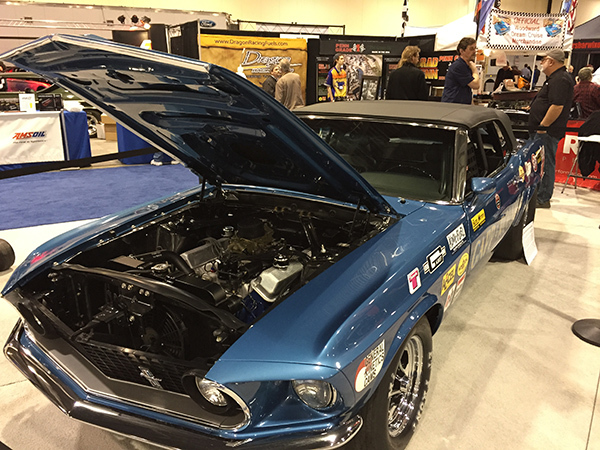 Guide to restoring a classic car: Many big-name races racers like Bob Glidden and Jack Roush made their mark running Mustangs in these classes, and the cars and stars are no less exciting today. The recent influx of factory drag cars has added to the existing brand rivalries and there is huge factory support to push these cars deep into the 8s. Today’s Cobra Jet Mustangs regularly see tough competition from the Chevrolet COPO Camaros, Dodge Drag Pak Challengers and the slew of original muscle cars that continue to compete. Recently on eBay a seller put a intake up for sale. 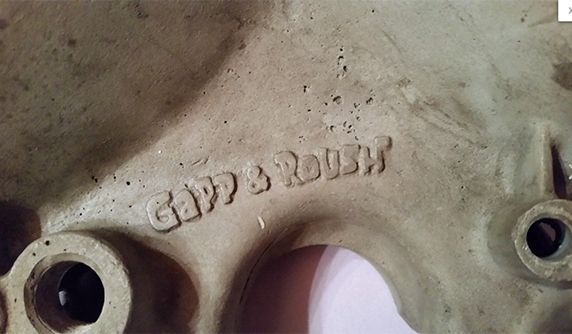 This intake was stamped ‘sample’ and included as part of the form the words ‘Gapp & Roush’. A picture of the intake from the post is below. The story of this intake is that while my Dad was building the ‘Country Shindig’ Maverick they needed an intake for the engine. 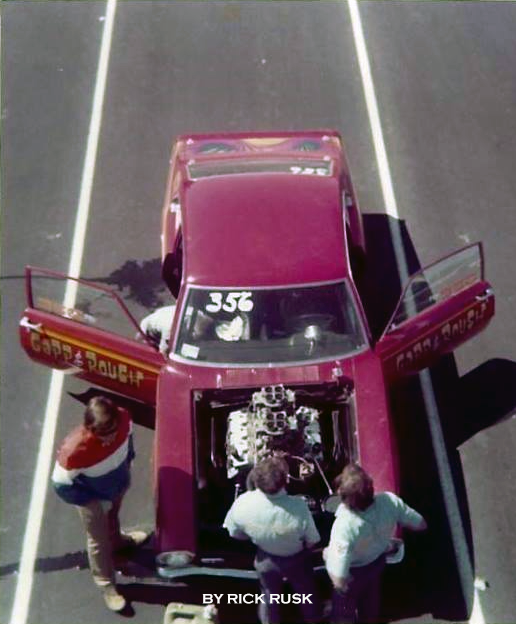 He then asked Louis Wlosinski to modify an existing Edelbrock 351 intake to fit the engine since that intake worked pretty well on the 351. If you now the story of the Country Shindig you know that the intake worked pretty well on the 302 in IHRA Super Modified class (as in the car was dominant). 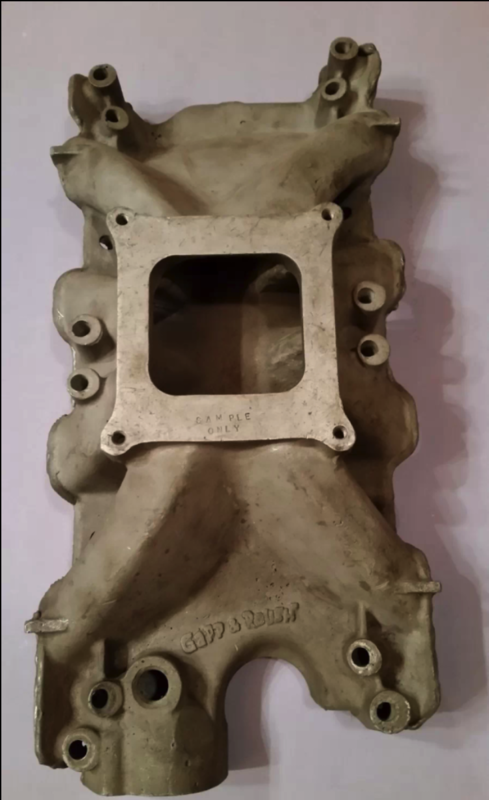 Jack Roush then took the manifold, had some samples cast (this example is one of those samples) and had a production lot made. 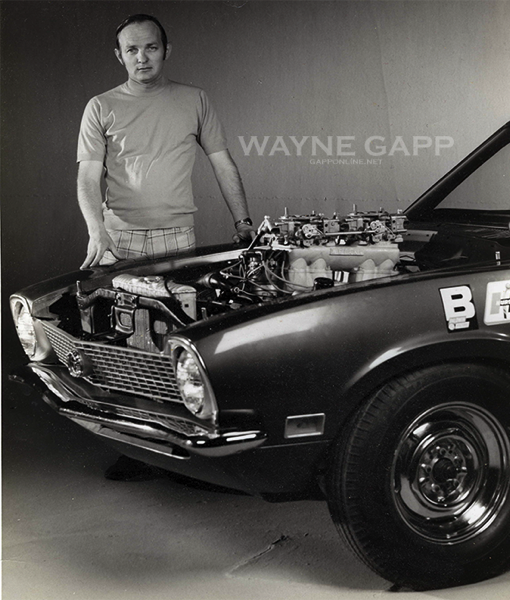 This is a fairly rare example as the ‘Gapp &’ part of the casting is still on the intake. After my Dad and Roush went their separate ways Roush still sold the intakes (why not?) but ground the ‘Gapp &’ portion of the casting off. The bottom side of this intake has welding beads all around the ports…probably for fitment? *Thanks to Tom Tate for passing along the eBay listing. 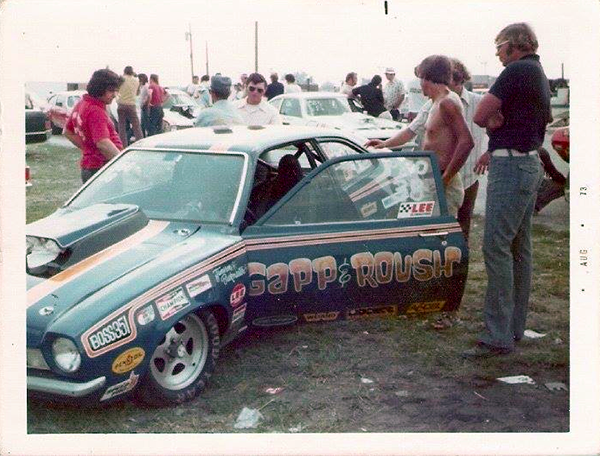 This shot was posted on the Nostalgia Pro Stock Facebook group by Rick Rusk. He noted that the image was probably taken @ Columbus in 1972. 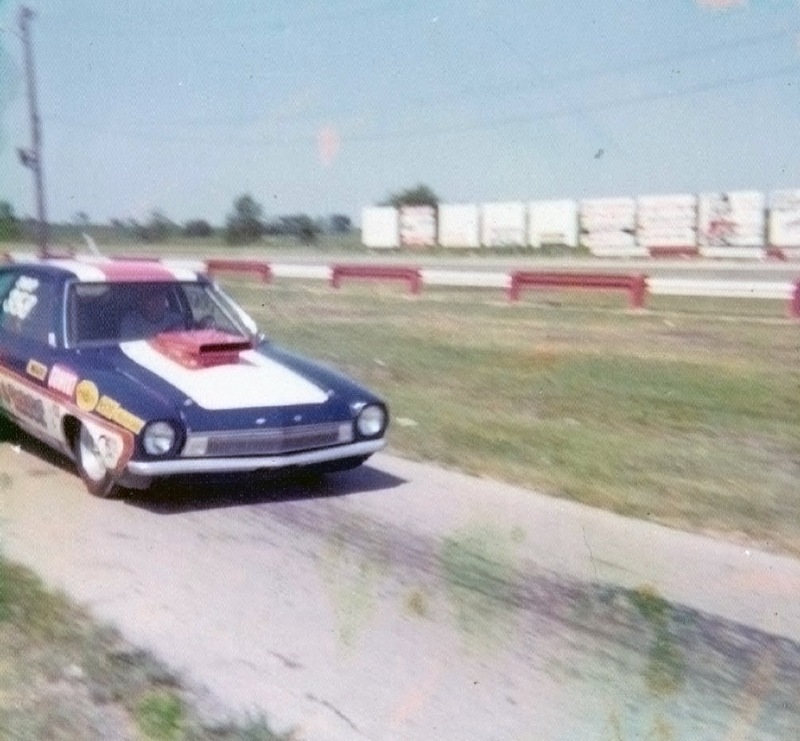 This is the ex-Barrie Poole Pinto that was purchased by Gapp and Roush and ran during the 1973 season. It was later destroyed. 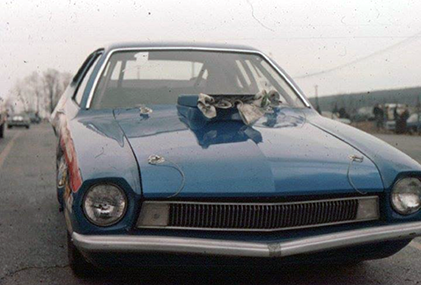 This image was posted in the Nostalgia Pro Stock group on Facebook by Al Lewis. 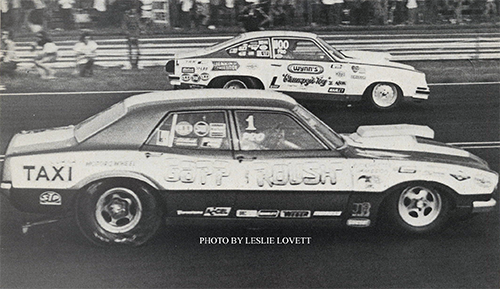 This picture comes from Drag Racing USA’s October 1974 coverage of the SummerNationals at Englishtown. Result: Runner up to Larry Lombardo. 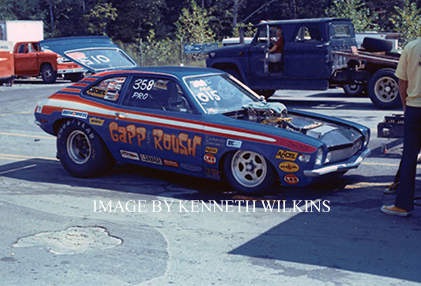 Another fine image by Kenneth Wilkins of the 1973 Ford Pinto of Gapp & Roush. This is part of set of images and here is a link to another one.